The first benefit that you will be able to enjoy is getting water that is totally free of contaminants. In getting contaminant-free water, you will be able to avoid water-borne diseases, toxic metals, and industrial pollutants. In removing these harmful contaminants, you will be able to reduce your risk of getting future illnesses. The most common chemicals found in drinking water are chlorine and fluoride. These chemicals are often added to water because it is part of the treatment process. The problem with these chemicals is that they can significantly affect your oral health as they can cause dental issues. Too much calcium in water source can be bad for your health. It is known as a contributing factor to developing kidney stones. Since other water sources can have a high amount of calcium in them, it can pose a health risk. To help you attain perfectly clean water, the distiller lets the water pass through a heated coil. Through this process, water is vaporized and then turns into steam. Once the liquid water has turned into steam, the steam then gets transferred into a cooling chamber where it then condenses into a liquid. As the distiller streams the water, inorganic compounds such as lead, calcium, magnesium, chlorine, etc. gets separated and then removed. Before you go and buy a water distiller for your home, you should first make sure that the distiller you are getting will fit your personal needs and preferences. 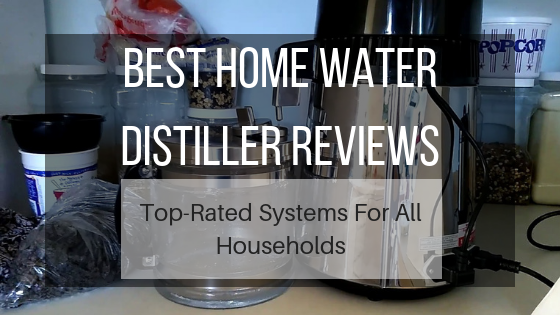 To attain the best water distiller for your home, try to use this short list of factors that I have prepared as a guide for the features you should never forget to consider. Water distillers aren’t cheap. That’s why you should always seek a product that is made with high-quality products and can deliver high-quality performance. Since this water will clean up your drinking water, make sure that its parts are made with food grade steel. You should also see to it that the product you are choosing will come with rust-proof steel that won’t contaminate your water after years and months of use. Distillers come in different shapes and sizes. If you are looking for a machine to put at home, try to choose one that comes in a small size that will allow you to place it on top of your kitchen counters. If you don’t plan to use it often, you ought to get something that will fit your kitchen cabinets or your available storage space. Since water distillers come with rather hefty price tags, you might as well make sure that the product you are getting is supported by a manufacturer warranty. A warranty is very important because it can help you avoid large costs if any repairs are needed when issues arise. If you are looking for a classic-looking water distiller that you can place on your kitchen counter, this water distiller from H2O Labs is a great choice that doesn’t only look great but can perform well. This small machine has been rigorously tested and evaluated for customer satisfaction, customer support, quality, economy, design, functionality, ease of operations, and dependability. It comes with activated carbon pods that can contain 3 times the filtering media and can last twice as long. This machine has been designed to provide you with water in its purest form. What I liked best about this water distiller is that it comes with an easy lift glass carafe, non-toxic cleaners, and a whole year’s supply of activated carbon pods. Another great thing about this water distiller is that it comes with the optimal size of watt heating element. Unlike other water distillers that come with big heating elements, this one comes with a medium-sized heater that can still boil water really quick without costing more energy. Needless to say, this water distiller is truly one of the best choices you can easily buy for your home from the market today. 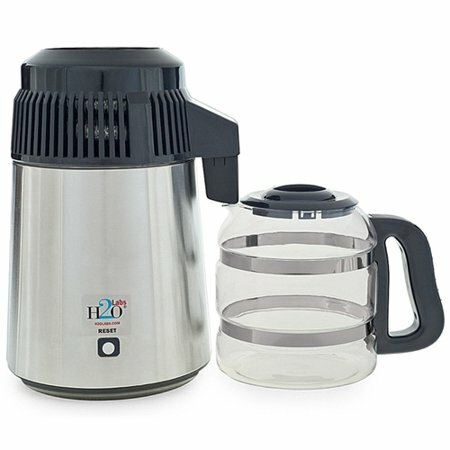 This water distiller from Megahome, a reputable company that puts all of their products under specific testing to make sure that each product complies with the necessary safety standards. In fact, this water distiller is one of the few water distillers that have been UL-approved. What’s great about this water distiller is that it can distill 1 gallon of water within only 5 and a half hours. It is made with interiors and exteriors that are built with 304 stainless steel. The water doesn’t even get to touch the plastic. Another great thing about this distiller is that it is backed by a 1 year warranty for service and support. This means that if any issues that require replacements or repair ever arise, you will no longer have to worry about the costs of fixing the machine yourself. But maybe my most favorite thing about this water distiller is how compact it is. You won’t have to worry about having a large counter space with this one since it’s practically an oversized tumbler. You can also store it with ease when not in use. If you are looking for a small water distiller that comes with a sleek looking design that never goes out of style, this one is probably the best choice for you. This is another UL-listed product from Megahome, ensuring that it will work in giving you the purest water. It is capable of producing 1 gallon of clean water in just 5.5 hours. The interiors are durable, having been fitted with 304 stainless steel interior. The water will not get in contact with the plastic materials of this product. The water reservoir is also made from glass so if you are worried about the plastic contaminating your drink, get this because of the materials used. It is also a compact product that you can easily display on your countertop or easily keep in your storage shelves. It is also easy to clean and has a warranty to back it up. Another compact water distiller I have included in this list is the pure water mini-classic CT counter top distiller. However, you must not get fooled into thinking that this small machine cannot perform as well as the larger ones in this list because it surely packs a lot of interesting features. What I liked about this machine is that it does not require any form of installation at all. All you really have to do is take it out of the box, place it on top of your counter, and start distilling gallons of water with it. Another great thing about this product is that it doesn’t let the water come into contact with its plastic materials. With this product at your disposal, you will certainly completely purify water without any contaminants such as chemicals and inorganic compounds. Perhaps the only downside to this water distiller is that it is much larger than the other ones I have included in this list. It may be about 2-3 times larger than the compact water distillers in this list, but It performs a little better considering its capacity and heating element. If you want to get extremely pure water that is free from any chemicals, inorganic substances, or other contaminants right at your home, then the waterwise 8800 water distiller purifier might be the best choice for you. What I like about this machine is that it comes with a very attractive design that can make it easy for you to pair it with the other appliances in your home kitchen. It also comes with a sleek design that doesn’t require much counter space and storage space if not in use. Another thing I love about this machine is that it can process 1 gallon of water much quicker than other water distillers in this list. It can easily distill 1 gallon of water within just 4 hours. We recommend all these products but for those in need of a more compact distiller that can easily sit on your counter space and doesn’t use up a lot of energy, get the H2oLabs Best-In-Class Stainless Steel Water Distiller. 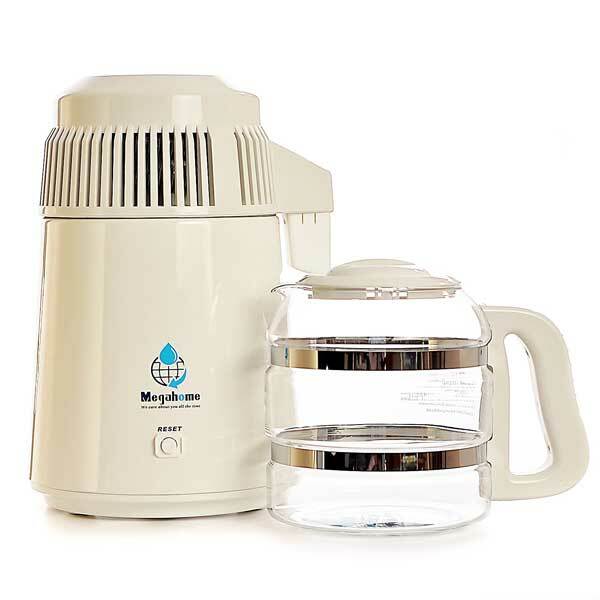 The Megahome Stainless Steel Countertop Water Distiller is an ideal choice for small families with 4-5 members. It has a good capacity that can supply you with fresh water that will last you for a day or two. Don’t like your water touching plastic? 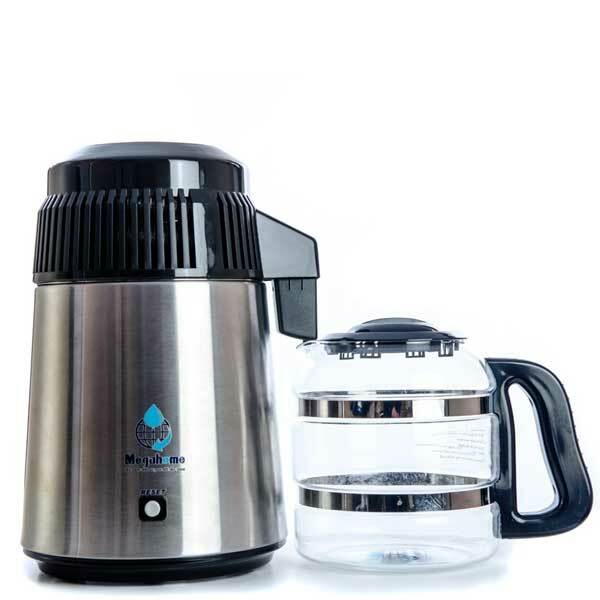 Get the Megahome Glass Countertop Water Distiller. It is made from glass with an interior that is made from high-grade stainless steel, so you can be assured that chemicals from plastic won’t reach your water. 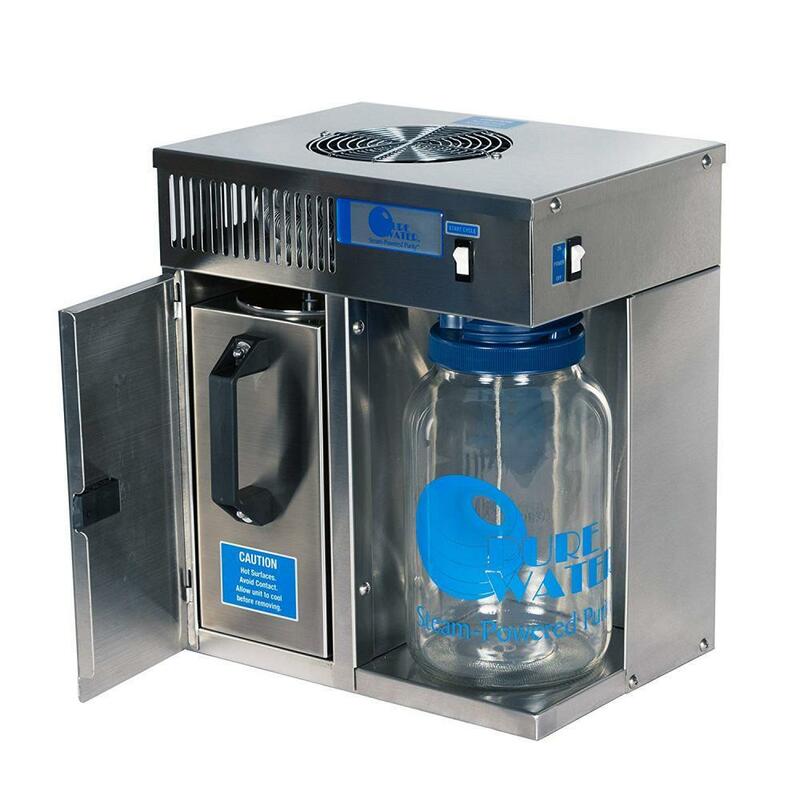 If you want something with a design that can easily fit corners and has a good capacity, get the Pure Water Mini-Classic CT Counter Top Distiller. It is also one of the easiest distillers to use out there, great for people who don’t want to use something too complicated. 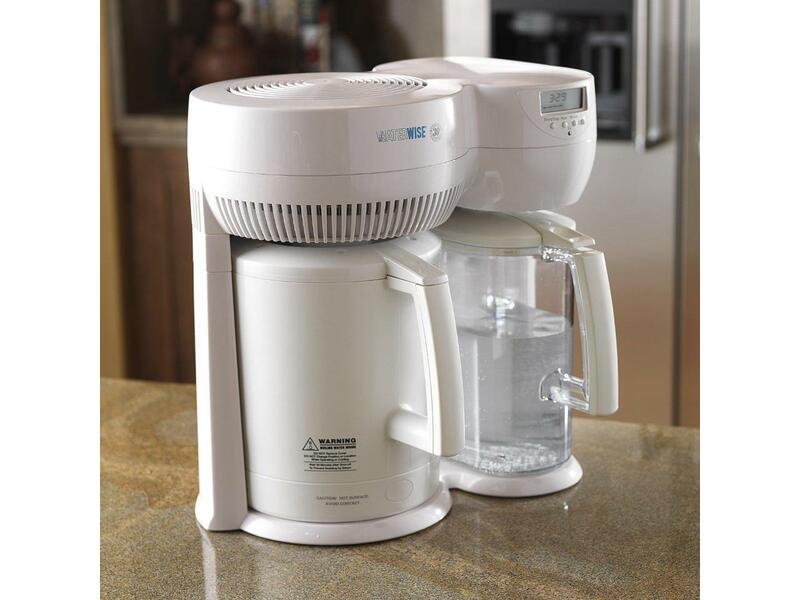 The Waterwise 8800 Water Distiller Purifier is ideal for those who want a quicker heating time. This is the quickest one to produce a gallon of clean water so if time is an issue in your household, this should be a sterling choice. It is more expensive though, so it might be more of an investment. If you are on a budget, this might not be for you. We've taken everything into account and decided that for reliability and ease of use, the H2OLabs model is the best water distiller on the market today. Choose from these products to ensure you always have fresh and clean drinking water at home. Check out our homepage as well for some more product recommendations and reviews to ensure that you have everything you need to make your kitchen more functional.